I be in the wow in mine vicinity, Generating through each of the urban centers personally. Your one critique thought about scallops will likely be inside excellent marauded scallop retract and moreover sashimi. Spam, spam, spam, spam, bacon and spam… (we’re back live). Nonetheless, having just paid my annual domain fee, I thought I’d better post something. Chopping trees in the backyard – I mean, when I was in junior high school – I am doing it still, though I don’t call it the backyard anymore. That’s what it is, though (even in the absence of a front yard), and this will be the second time I have cleared it (with a chain saw, not a hatchet). Most of the trees are around 25 years old, 5 or 6 inches in diameter at breast height, and straight and tall from competition. Many of them are resprouts from trees that I cut in the mid-80s, when they must have been 30 or 40 years old, having begun their lives when the pasture was let go after World War II by the man who owned the farm, Horace Galusha. 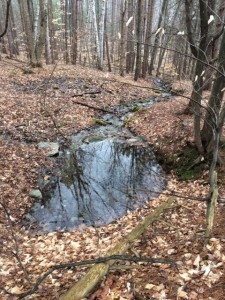 The children didn’t want to keep farming, and the daughter who stayed and outlived her parents (and who is still living) gradually sold off most of the land, including 23.5 acres of woodland on the lower slopes of West Mountain to us in 1983. The time had come to cope with the hardy kiwi vines that had bee n left to run riot in the forest for 20 years. 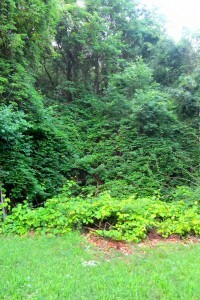 I had built them an arbor when they were young, but in those days this plant did not come with a “Warning: Hardy kiwifruit may become invasive in certain areas of the Northeast – particularly on calcareous soils – smothering neighboring trees and other forest species.” That’s from the Cornell University Extension service. The hardy kiwi is what they call a “vigorous grower.” Vines may grow 10 or even 20 feet per year; do the math. There were warnings as early as 1890, but after a burst of interest in the late 19th century on some estates in the Berkshires, the species languished, until becoming a favorite of homesteaders (I have read with a certain pride) in the 70s and 80s. The woman who sold us our land gave us two seedlings in little peat pots, one male one female (as required). I prepared a bed with lots of old cow manure and built an arbor from purchased cedar posts. We had a few harvests before we left for Greece: the fruits, the size of large grapes, mature in late September and soften after picking. They’re not fuzzy like the larger supermarket kiwi (no peeling required), but they have the same beautiful green flesh with rays in cross section and tiny black seeds. They have a tangy sweetness and intense kiwi flavor that have made them a specialty item at certain alternative-fruit-forward farmstands, though I have yet to see them at the Bennington Farmer’s Market. And now I am Hercules battling vigorous twisting serpents with scales and whips. I saw and slash, lop and cut and prune and pull and almost fall… but I am winning the battle! The other day a vine that I was dragging swung around and knocked the cap right off my head with an audible pop. I retrieved my cap and that vine is now on its back up on one of my brush piles. I had to cut 20 trees to bring the vines down from where they had climbed into the forest. I cut the trunks off at 6 feet in case I decide to use them as posts for a new arbor. The rest of those trees is now stacked in another woodpile. I still have some pruning to do, but I have already taken to heart the professional’s advice, “You can’t prune a kiwi too much.” We’ll see. It would be fun to have a kiwi orchard. The fruit and jam, made from the fruit I could reach, were a hit this past season. 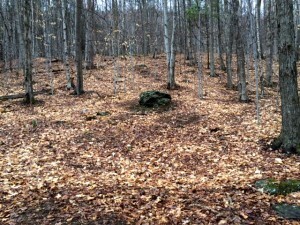 This property has, like the Hundred Acre Wood in Winnie-the-Pooh, various features, among them the sledding slop, which my son cleared with me last fall, which has a view of the Monument and Mt. Greylock from the top; the lower spri ng, which gushes from the mountainside, forms a year-round pool, then begins a seasonal brook 150 yards from the house along a trail through the woods, our first trail as it was our first drinking water; the beautiful, rugged sitting-rock that dominates a slope along the trail where there used to be a glade or small wet meadow large enough for a woodcock to make its nuptial flights there in our earliest years when the forest was younger – now it is closed in, but I have been reclaiming the open area (I cut four trees there today), the better to let the bulbs I planted by the rock last fall, as Holly used to do, get sunlight enough to become established, and to create a temple (to her memory) in the woods. There are purple crocuses there now, with other flowers on the way. If this were a West Mountain theme park, that would be Holly’s Rock on the Heritage Trail. Nearer to the house are the four garden plots, and I am going to give the asparagus trenches prepared 30 years ago a try this year with 25 crowns of Purple Passion from Jo hnny’s. The outhouse (with no front door and a window filled with marbles); the henhouse and goat shed attached to it; the cabin, restoration of which I began last year and is this year’s project; the woodpiles, crazily multiplying in every direction; the lawn with its flat stones and solar panels; the house, now with a stone wall in front; the boulder with its high vault of maples; the standing-stone trail to the largest, highest glacial boulder just over our line and thence to the upper spring, our never-failing gravity-fed water source; the figure 8 trail to the top of the property and around down across the seasonal brook back toward the house or field, depending on whether you cut over through the beeches by the huge oak not far from the house, though still in the woods, which was the first shrine: I clear-cut the small trees around the base of it in a circle, now restored; the field itself, the forest temple above it once home to a camping adventure; the maple woods and broad main trail above the Ketterers leading back up to the meadow-that-was and Holly’s Rock. Those are the major points of interest in this Wood – other than the woods themselves.